Not to be confused with Sacramento Valley. The metropolitan area experienced a growth of nearly 20% in the last decade. In the 2000 census, the Sacramento MSA had a population of 1,930,857 (though a July 1, 2009 estimate placed the population at 2,458,355). It lies in the Central Valley and Sierra Nevada regions of California as well as a small region of Western Nevada. Greater Sacramento is anchored by Sacramento, the political center of California, the nation's most populous state with the largest number of representatives in the U.S. government, home of the California State Capitol and the secondary location of Supreme Court of California and was the original terminus for the First Transcontinental Railroad. Greater Sacramento also contains sites of natural beauty including Lake Tahoe, the largest alpine lake in North America and numerous ski and nature resorts. It is also located in one of the world's most important agricultural areas. The region's eastern counties are located in Gold Country, site of the California Gold Rush. Recently it has been one of the fastest growing regions in the United States as Sacramento continues to emerge as a distinct metropolitan center in the United States as well as having cheaper housing for commuters from and to the nearby, more expensive, San Francisco Bay Area. El Dorado, Placer, Sacramento and Yolo counties comprise the Sacramento–Arden-Arcade–Roseville, California Metropolitan Statistical Area. Sutter and Yuba counties comprise the Yuba City Metropolitan Statistical Area, known as the Yuba-Sutter Area. Nevada County comprises the Truckee-Grass Valley Micropolitan Area, and Douglas County comprises the Gardnerville Ranchos micropolitan area. Sacramento is the largest city in the metropolitan area, home to nearly 470,000, making it the sixth largest city in California and the 35th largest in the United States. It has been the state capital of California since 1851 and has played an important role in the history of California. When gold was discovered in nearby Sutter's Mill in Coloma, Sacramento became a boom town luring in migrants making their way from San Francisco to the gold fields of the Sierras. Although it did not become the financial and cultural center of Northern California, titles that were given to San Francisco, Sacramento became the largest transportation hub of not only Northern California, but also the West Coast following the completion of the First Transcontinental Railroad. Sacramento today continues to be one of the largest rail hubs in North America, and its rail station is one of the busiest in the United States. In 2002, Time Magazine featured an article recognizing Sacramento as the most diverse and integrated city in America. Government (state and federal) jobs are still the largest sector of employment in the city and the city council does considerable effort to keep state agencies from moving outside the city limits. The remainder of Sacramento County is suburban in general with most of the working population commuting to Downtown Sacramento and with a smaller proportion commuting all the way to the Bay Area. Yolo County serves as a commuter region as most of its working population commutes either to the Bay Area or Sacramento for work but is home to the University of California, Davis campus, the northernmost UC campus and only UC campus in the Greater Sacramento region. El Dorado and Placer Counties form the remainder of the inner core of Greater Sacramento and are composed of the Sierra foothills and mountains. The western areas of the counties are composed of commuter suburbs to Sacramento while the eastern areas border Lake Tahoe and are home to numerous ski resorts and towns such as South Lake Tahoe, site of the Heavenly Mountain Resort, which are popular in winter months and nature camps and resorts in summer months. Placer County has been an important mining area not only for gold, but also other minerals and granite. It is also the site of Squaw Valley, which hosted the 1960 Winter Olympics, which has been up to date, the only Winter Olympic Games to be held in California and the US West Coast and the smallest city to host an Olympics. The Yuba-Sutter Area consists of Yuba and Sutter counties and is a primarily agricultural area, although the southern area is more suburban in character. It is home to Sunsweet Growers, which owns the world's largest dried fruit plant in Yuba City. Nevada County, like El Dorado and Placer Counties, borders Lake Tahoe and contains numerous ski resorts such as the Boreal Mountain Resort, but is more rural than the former two counties and is an important gold mining area. The Donner Memorial State Park is located in the county, where the ill-fated Donner Party was trapped in winter storms in 1846–47 while attempting to make it to California on a poorly organized trip. Douglas County, is the only county in Nevada in the Greater Sacramento area and is the only non-Californian county to be located in a California metropolitan region. The addition of Douglas County is recent, as Greater Sacramento continues to grow beyond its inner region, Western Nevada continues to be influenced by Sacramento and California and their cultures. This gradual "Californiazation" of Western Nevada is the work of a theory of an expanding megapolitan area of Northern California which is believed to be part of a " California megalopolis" stretching from Greater Los Angeles to Greater Sacramento and including the Bay Area and Metropolitan Fresno, in a similar urbanization idea as the Northeast megalopolis that includes the New York City, Philadelphia and Washington D.C. areas. 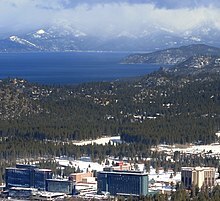 Douglas County is home of Tahoe resorts and casinos as well as suburban outskirts of Sacramento and Reno. The western half of Greater Sacramento is centered on the Central Valley, one of the most vital agricultural areas in the country. The Sierra Nevada and its foothills compose the eastern portion of the region. Yolo County contains a large flood control basin. 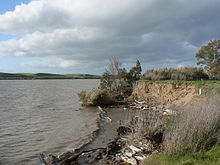 The Sacramento River and the American River are major rivers that form a deepwater port connected to the San Francisco Bay by a channel through the Sacramento River Delta. Coniferous and oak dominated woodland are prevalent in the Sierra Nevada and the Lake Tahoe area. Sacramento and the valley area have a Mediterranean climate ( Köppen Csa), characterized by damp to wet, cool winters and hot, dry summers. The wet season is generally October through April. Summer heat is often moderated by a sea breeze known as the "delta breeze" which comes through the Sacramento–San Joaquin River Delta from the San Francisco Bay. January is the coolest month for the entire region with an average maximum of 41.0 °F (5.0 °C) and an average minimum of 15.1 °F (-9.4 °C) in Lake Tahoe. As of the census  of 2000, there were 1,796,857 people, 665,298 households, and 445,753 families residing within the MSA. The racial makeup of the MSA was 70.0% White, 7.1% African American, 1.1% Native American, 9.0% Asian, 0.5% Pacific Islander, 7.2% from other races, and 5.2% from two or more races. Hispanic or Latino of any race were 15.5% of the population. The median income for a household in the MSA was $48,401, and the median income for a family was $57,112. Males had a median income of $43,572 versus $31,889 for females. The per capita income for the MSA was $23,508. Owing to its central location between the Bay Area and Nevada border, Greater Sacramento is a key transportation hub into Northern California. While the region doesn't have an extensive public transportation system as the San Francisco Bay Area, Greater Sacramento has had an earlier history of public mass transit and is served by a vast freeway system as well as some light rail. Sacramento is the largest rail hub west of the Mississippi River and was the first terminus of the First Transcontinental Railroad before it extended to Oakland. The Sacramento Valley Station is the largest train station in the region, near Old Sacramento, and is connected by the Coast Starlight, California Zephyr, San Joaquins, Capitol Corridor and Thruway Motorcoach Amtrak routes. The Sacramento Regional Transit District is the local transit agency for Sacramento County and operates three light rail routes, the Blue Line, Green Line, and Gold Line, along 42.9 mi (69 km) of right-of-way that serve Sacramento and its immediate suburbs. Other train stations in the Greater Sacramento area are Davis, Roseville, Rocklin, Auburn, Colfax and Truckee. The main airport servicing Greater Sacramento is the Sacramento International Airport north of downtown while the Sacramento Mather Airport, Sacramento Executive Airport and Minden-Tahoe Airports provide general aviation. The Reno-Tahoe International Airport in Reno provides more direct access to Lake Tahoe than Sacramento International. For a wider range of destinations, residents must travel down to San Francisco International Airport, the largest airport in Northern California and 10th largest in the United States. Greater Sacramento is served by extensive bus systems that link the region to the Reno and Bay Area metropolitan areas. The Sacramento Regional Transit District operates bus lines in Sacramento County and Yolobus serves Yolo County while providing connections to downtown Sacramento and northern Solano County in the Bay Area. El Dorado Transit links El Dorado County with downtown Sacramento and the city's western suburbs. Placer County Transit and Roseville Transit link Sacramento with Placer County with the latter providing direct connection from Roseville to Sacramento. The Yuba-Sutter Transit provides bus service in the Yuba-Sutter area and direct connection to downtown Sacramento on weekdays. Gold Country Stage and Tahoe Truckee Area Rapid Transit serve Nevada County and transfer service to Auburn to Sacramento is provided. Greyhound, Megabus, Flixbus, and Amtrak provide long-distance bus lines to Greater Sacramento. Greater Sacramento's higher education system consists of the northernmost University of California campus, University of California, Davis, California State University Sacramento ("Sac State"), as well as several community colleges in the region. 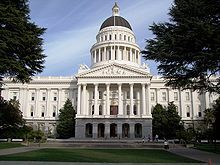 In addition to being home of the state capital of California, Greater Sacramento is considered a politically competitive area with no major political party having a majority over the region. Sacramento and Yolo counties have large Democratic pluralities with Democratic majorities in the recent 2008 presidential election, the former county being mainly urban and the latter home to the strongly Democratic university town of Davis. El Dorado, Placer, Yuba, Sutter and Douglas counties are predominantly Republican while Nevada County, despite a history of being held by Republican candidates, reflects the metropolitan area's competitiveness with pluralities between the two major parties and with a Democratic majority in the 2008 presidential election. Greater Sacramento is the only metropolitan area in the West Coast and in California to have ever hosted a Winter Olympic Games when Squaw Valley hosted the 1960 Winter Olympics, becoming the smallest city to ever host an Olympic Games, a title it still holds. Squaw Valley was the second Olympic games hosted in California and the only one not held in Los Angeles, where the 1932 and 1984 Summer Olympics were hosted and was the only Winter Olympics held west of the Mississippi River until the 2002 Winter Olympics in Salt Lake City. Greater Sacramento is also home to minor or secondary league sports teams. The Sacramento Republic FC play soccer in the United Soccer League (USL) at Papa Murphy's Park, a soccer stadium located on the grounds of Cal Expo. A new stadium in downtown Sacramento is under construction,  and is a major selling point for the team's bid to secure a spot in the MLS professional league. The Sacramento River Cats is a triple-A baseball team affiliated with the San Francisco Giants. The team plays in West Sacramento at Raley Field, which is located just across the Sacramento River from downtown Sacramento. The team is part of the Pacific Coast League. ^ "Annual Estimates of the Population of Metropolitan and Micropolitan Statistical Areas: April 1, 2000 to July 1, 2008". US Census Bureau. Retrieved March 22, 2009. ^ Metcalf, Gabriel; Terplan, Egon (November–December 2007). "The Northern California megaregion". The Urbanist. San Francisco Planning and Urban Research Association. Retrieved November 21, 2009. ^ Stodghill, Ron; Bower, Amanda (2002-08-25). "Welcome to America's Most Diverse City". Time. ^ "Table 2. Annual Estimates of the Population of Combined Statistical Areas: April 1, 2000 to July 1, 2009 (CBSA-EST2009-02)". 2009 Population Estimates. United States Census Bureau, Population Division. 2010-03-23. Archived from the original ( CSV) on April 20, 2010. Retrieved 2010-03-29. ^ "Climate for Sacramento, CA". RSSWeather.com. Retrieved 2009-03-13. ^ "Supplement to the Statement of Vote: Statewide Summary by County for United States President" (PDF). California Secretary of State. 2009-04-10. Archived from the original (PDF) on 2009-06-12. Retrieved 2009-08-21. ^ a b Lillis, Ryan (2017-07-27). "Big step in Sacramento's Major League Soccer bid". The Sacramento Bee. ISSN 0890-5738. Retrieved 2018-06-26. ^ "WNBA's Sacramento Monarchs fold". Bay Area News Group. 20 November 2009. Retrieved 21 November 2009.